This page will be a place for us to give you updates on the new building and new items we are developing here on the farm. Keep checking in to see the progress of the new building! We are constantly trying to use old things that have either stopped working or look to have life other than what it was original used for. This is called Revisioned! 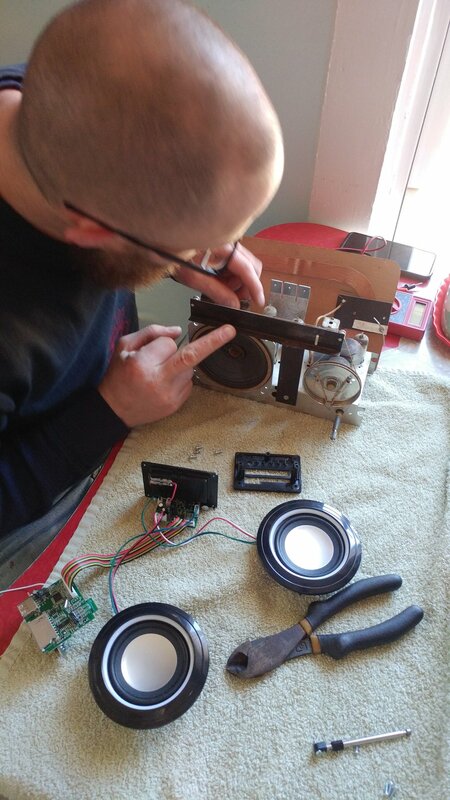 Part of our Revisioned line has been taking old Vintage and antique radios and giving them new life. It looks like a 1950’s radio from the outside, but we have updated these radios with Bluetooth, new FM radio and speakers. We try to keep the look of the old, but know that they need to compatible with what is new in this day and age for listening pleasure. This one we are working on actually has lights in it. When you want to see them just flip the switch in the back and you can see the lights in the front flickering about. If you don’t want to see them, you simply turn off the switch in the back. These are fun radios for the young and the old. We will be putting these up on our web store very soon, so please watch for them. I just wanted you to see what we go through when we Revision an item into something new. If you would like to see more pictures of this project, please click the link below. 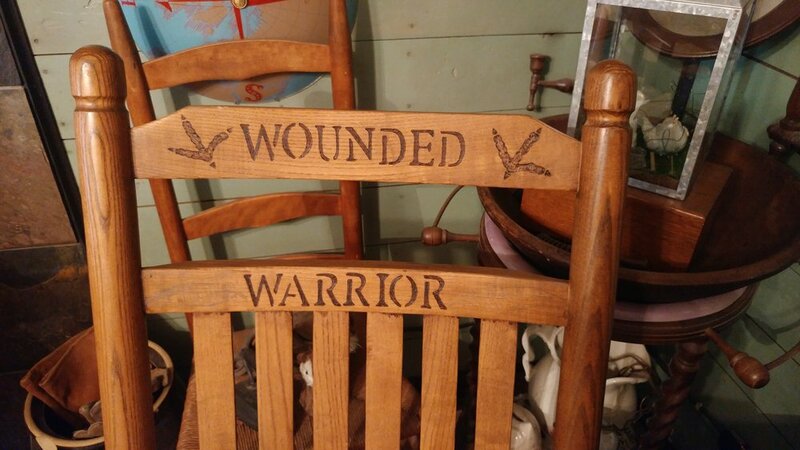 I was asked this winter to work on a very special project for the wounded Warrior chapter in our area. Being that both my husband and I are Army Vets, it was a no brainer that I was going to do this for them. Every year the chapter in this area puts on a Turkey Shoot for the Wounded Warriors in our area and they give one special Vet a door prize. 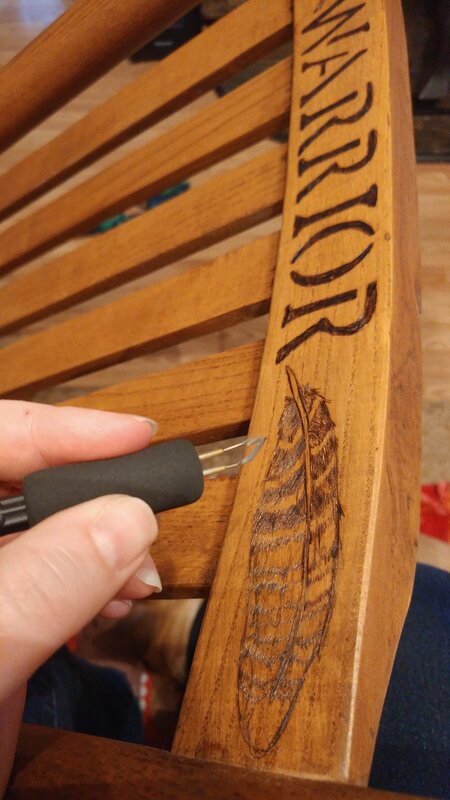 This year it will be a rocking chair that I wood burned on. I was so proud and so honored to be asked to do this and I do hope to do this again for them next year. If I can still serve my brothers and sisters by doing this, then I will. If you would like to see more pictures of this project, please click on the link below. We have been working hard to get the Store and Studio ready for this year. Throughout the winter we finished insulating the Studio, and then started to work on getting the blacksmith shop ready. In the Blacksmith shop space, I actually have a place to store and see all my Vintage glass that I use for my feeders! Makes life so much easier when making these feeders to see what I have and not have it all in boxes. We are still working on both, but are getting very close to seeing the end result! This past weekend was the first time we got the forge up and running. We still have a lot to do, but we are closer and he actually made some items so we could put them in the store! The Store has come a long way. We are waiting for the weather to give us at least a week of sunshine, so we can get the walls prepped. We have old wood siding from an over a 100 year old home to be the walls in the store, but we need to prep these, in order for us to use them. Weather please play nice soon! My Studio is another Monster all together. I have everything up there, but we are far from finished. Still need walls, floors and shelves, but I am able to work up there, which is the good thing. Been hard at times, but we are making it work. This year will be a great year to share everything we are doing here on the farm, I can’t wait. If you would like to see more pictures of the Store and Studio, please click on the link below. 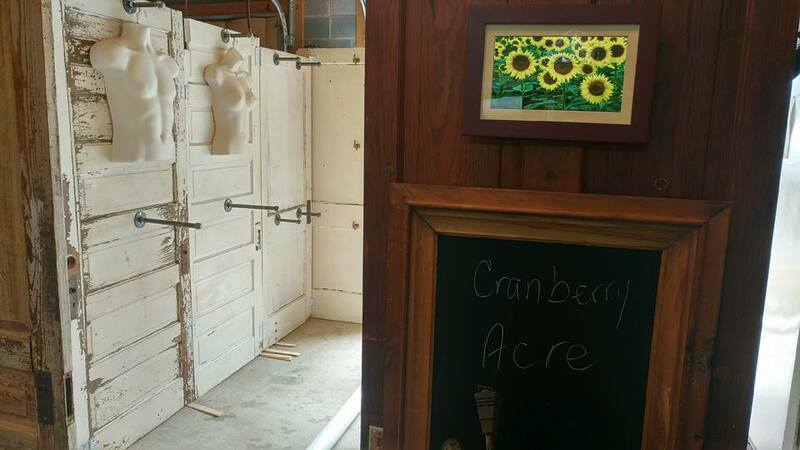 Thank you for supporting Cranberry Acre. Please visit or store by clicking the link. We had our Grand Opening July 29, 2017, what a great day. It was amazing to see so many people to share in our dream. We set up a kid’s tent so they could learn about planting and recycling cans. I tried my best to be everywhere at the same time and became very aware, very quick, that I could not. I helped with the tours of the farm, the kid’s tent when I could and of course was in the store! I can’t tell you the joy of seeing people smile while they are talking to you about your dream. The support from our community has been amazing and I hope we can keep this going until the end of our days, because there was such joy on that day. Now the Store and Studio still has some work to be done, but we are now open for business Tuesday thru Saturday 9am to 5pm. The farm is also open to the public to come by and spend time in the gardens or with our Cranberry Critters, who are always happy to see people. When you are in our neck of the woods, come by and say hello, we would love to see you. If you would like to see more pictures of the Grand Opening, Please click on the link. WOW, July is here!!! We won’t be totally done for opening day, but we will be close. Life sometimes demands to set you back for whatever reason and it did this to us in June. It is disappointing, but there is not much you can do, so embrace it. In my life I have never really called on anyone to help. My husband and I have always been there to help others and I think it was not in my nature to scream for help, but I did. I have been searching for a community since I left my hometown of Stamford NY. It has been hard to get used to the fact that neighbors don’t know each other even if you try to know them. Seems like everyone is okay with not knowing each other, which for me is odd. Coming from such a small town where everyone knows everyone, we helped each other. Well I needed help! I found myself with a bunch of small things that needed to get done here for the Grand Opening, but I was running out of the days to do it. I called on my own community of people to help and boy did they help! This was also a surprise for my husband Wayne, who had been left to do a lot of the things I was unable to finish, a daddy day present from our friends. I can’t tell how amazing it was to see so many people coming together to get some pretty hard work, done for us. Very humbling, and at that moment I realized that the community of people I was searching for were here. We may not live down the road from each other, like I did in Stamford, but we are here for each other and that is community. The pictures speak for themselves and I do hope you take the time to look at them in the photo album. It was an amazing thing to see. With their help on that day, we will be ready for the Grand Opening on July 29th. I do hope you all have the time to come out to spend here at the farm. To see more pictures of this day, please click on the link below. We haven’t really been able to do much this month with the building. We have been fighting rain and days that we are not doing something else to finish the painting. I finally have set up the downstairs so it looks like a store now, so we know where we will be running electric for the store. Now my studio upstairs is patiently waiting for its design. All in time. We will still be having our Grand Opening no matter what! Things seem to move at their own pace at times and we never seem to have control over that and that is okay. 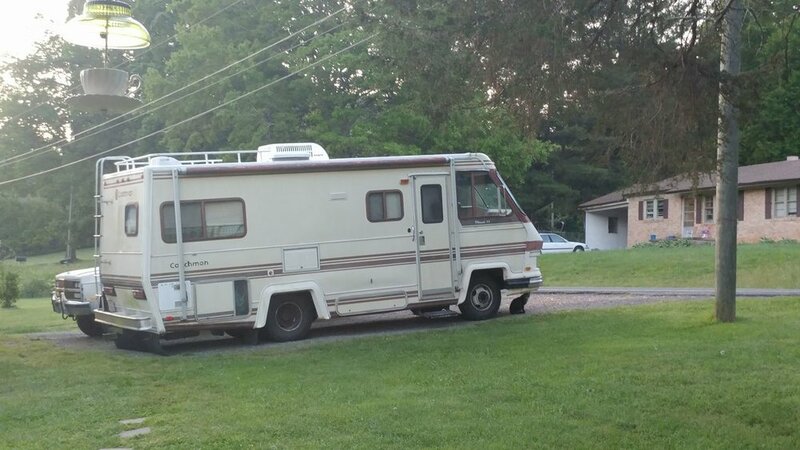 We purchased a motor home this year to help with hotel costs when we have 2 day shows far from home. Well with every used and old vehicle, there are quirks that need to be worked out, this one had many that we did not expect, but are dealing with. We are now renovating it so it works for us better. We have now done a couple shows with our new display and it has been received very nicely. It gets easier to put up now and put away for trips. I tell you I love my doors, but Lord they are heavy! To see more pictures of the Store and Studio, plus the renovations of the motor home, please click on the link below. We are moving along with the Store and Studio as fast as we can. With the Grand Opening being on July 29th, we have so much to do. Seems like the month of April has been nothing but rain, which has slowed us down on getting the building painted. Our hope is to have it painted in a week or two, so we can move onto the electric in the building. Wayne used some old picket fencing, that we had acquired, to do the skirting of our building. We will pressure wash this and then paint it red as well. The overhang we had built, will be Wayne’s Blacksmith shop. This will be an amazing addition to our farm and to our ever growing business. I’m so excited for this to be a part of Cranberry Acre. Our dog Dingo has become the Store’s porch dog, while we are working he lays in the sunshine enjoying the day. He hasn’t really figured out the whole thing yet, just knows we spend a lot of time out there. During our little last stand of winter, I thought I had lost my Japanese Magnolia, but to our surprise, she bloomed! Our hope is to get the building completely painted this month and have the electric in the building. We can only do so much with the time we have to work on this, but it is coming along nicely. We finally have two shows under our belt for this year and the new display has gotten a lot of attention. Wayne had worked so hard on this display and it is really something to see when it is set up. 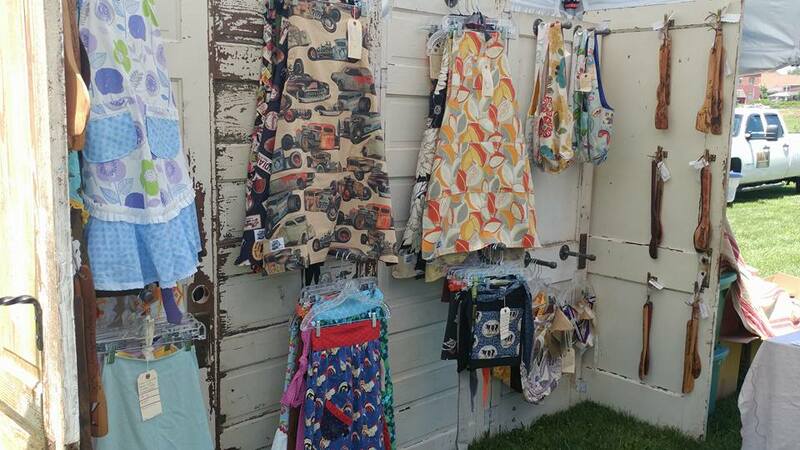 The second Friday in May, I’ll be at the local Farmer’s Market and during Memorial Day weekend, we will be in Roanoke, VA, so maybe you will be lucky to see it firsthand! To see more pictures of all the stuff we have been doing to the Store and studio, please click on the link below. We have been so busy with both the new display and the building. Our first show is sneaking up on us very quickly and the display needs to be done, but also we are trying to get some things started in the building so I can use it. Been a tug of war kind of thing. Right now I'm sort of setting the store up as I get new tags done and new pictures. I also have set up a phot booth so I can take pictures, so the building is being useful, without being finished. Good news is the display is probably only days from being completed, so then we can move to the massive work of the Studio and Store. I’m a type of person who tries to be patience with the time needed to progress, but for these projects I’m finding it very hard. Kind of like a child on Christmas morning, you just can’t wait. We also have decided once the store is open, that we will also start helping other small businesses out by having their items available at our store and online. This for me is an exciting opportunity to give others. One of these businesses is a Japanese White Sauce, called Sachi and the other is jewelry made with precious stones! Can’t wait to show everyone. The Sachi Sauce will be available in our online store this weekend! My husband, Wayne has done an amazing job with taking the idea in my brain and making it a physical object. All I can say is it is amazing. Wayne will also be show casing his forging skills with the new hangers he designed for me. I cannot wait for the building to be done so he has his blacksmith shop! Once that is done he can make his items for us to carry, which will be such an exciting day. Baby steps to our goal. We never thought we would be here, but here we stand! To see more pictures of our progress, please click on the link below. Oh and go by the pictures to see our cash register. We have struggled with knowing what was the right thing for us to do as a business. Do you rent a place, just concentrate on going to shows, or do you worry about the internet only? I truly wanted a place that we could showcase our product. I have had my things on consignment in other people’s places, but always had to worry about restocking my area and making sure it was kept up. When you are making things by yourself it is hard to get away from the workspace to do so. I have been doing Farmer’s Markets and shows now for almost 6 years and starting to feel it. I really wanted a place here to have my stuff, so we made the decision to make the Store and Studio space here on the farm. This year is a year of making changes. Not only did we start the building, but we also started this website. We are growing hopefully in the right direction. I was so amazed on how fast this crew worked to get our shop finished. It took them 7 days to complete it, yes 7 days. Now we still have a lot to do but Holy Cow this building is actually sitting here on the property. Now we have the job of painting it and getting the inside ready. It won’t be easy but we will get it done. Step by step we are making a dream a reality. If you would like to see all the pictures on this build, just click on the link below to see them. We are so excited about this new adventure for our farm. We are in the process of having a 2 story studio and store built here at Cranberry Acre. The other day we got our first truck load of items to build it. We have another truck coming next week for the rest of the materials. Building will start on the 20th of this month!!! This month we are also working on our new tent display. It will be a lot harder to put up, but will look more like a store front when done. I'm so excited to get this year started. To see more pictures, just click the link.